CRANE, Ind. – A Navy engineer has invented a groundbreaking method to improve night vision devices without adding weight or more batteries. Dr. Ben Conley, an electro-optics engineer at the Naval Surface Warfare Center-Crane Division, has developed a special metamaterial to bring full-spectrum infrared to warfighters. On August 28, the Navy was granted a U.S. patent on Conley's technology. "Our ground forces will be able to see much more, with better clarity, in all environments including caves and tunnels," Conley told TechLink. "Enemy forces hiding in the bushes? No problem, we'll see their body heat." Benjamin Conley is an electro-optics engineer at the Naval Surface Warfare Center-Crane Division. Instead of treating infrared light as a particle as most physicists do, Conley, a Marine combat vet, treats it as a wave. Using tiny metal structures (you'd need 25 of them to equal the width of a human hair), Conley built an infrared antenna that can see the waves. Recall that night vision technology was first used in World War II but got a big boost during the Vietnam War when U.S. forces used "Starlight" scopes. The sights and goggles, then and now, intensify visible light and just a bit of near-infrared radiation. But defense scientists have been working to advance U.S. capabilities as near-peer adversaries like Russia and China attempt to catch up. Conley's metamaterial antenna will expand the sensed spectrum, adding short and mid-wavelength infrared. This isn't a new concept, but other "fusion" devices combining near-infrared and infrared together are bigger and require additional battery power that increases system weight. That's a no-no in the world of ground combat where lighter is always better. Conley's new infrared image intensifier, or "I-cubed," as he calls it, will add no weight and require no additional battery power. For the past 12 months, Conley's been funded by the Office of Naval Research. He's hustling now to prepare a prototype for testing and evaluation within three months. In coordination with the Technology Transfer Office at NSWC-Crane, TechLink, the Department of Defense's national partnership intermediary for technology transfer, is marketing the technology to companies for night vision devices or other applications like machine vision, thermal imagers, security systems, and self-driving cars. Businesses that can integrate Conley's invention into their products, whether they be night vision goggles or self-driving cars, will need a patent license agreement that includes a commercialization plan, said Sean Patten, senior technology manager at TechLink. The first step for interested businesses is to contact Patten, who can provide no-cost licensing assistance, which includes the development of a commercialization plan and patent license application. "This is going to be a game changer for our warfighters; this is why we have DoD labs, to keep our advantage on the battlefield," Patten said. "Tech transfer is the first step in seeing technology like this come full circle back to the warfighter, but also see if it can be of use in non-military applications." Conley is motivated to see the technology transition back to the warfighter. He earned his doctorate in microelectronics after six years as a Marine infantry sergeant. His first experience with infrared imaging was behind the sights of an anti-tank guided missile system. 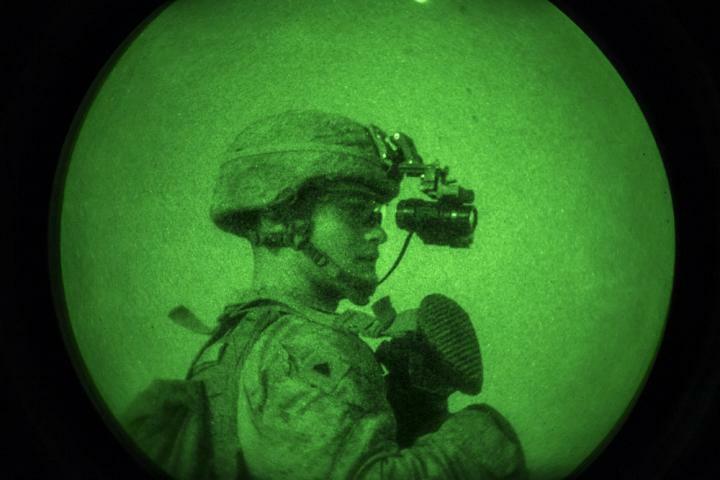 "Night vision is a huge topic area for the military so we're coming up with innovative ideas, pioneering technologies really, that support current and future requirements," said Conley. "I'm really committed to developing this because U.S. equipment has to stay on the cutting edge." To learn more about licensing U.S. patent 10,062,554 email Sean Patten at [email protected] or call 406-994-7721.